Camping du Lac de Saint-Cyr si trova a Saint-Cyr, Vienne, è situato a un lago. Questo campeggio dispone di piazzole delimitate, sia ombreggiate che, senza ombra e piazzole poco ombreggiate. Camping du Lac de Saint-Cyr si trova nei pressi di una spiaggia di sabbia. È possibile affittare tende e casemobili. Il campeggio dispone di un parco giochi e di un campo sportivo. Per gli sportivi, il campeggio prevede un programma di escursioni. Ci sono un programma di animazione e uno spazio fitness. Il campeggio dispone di una piscina scoperta e una vasca per i più piccoli. Nelle immediate vicinanze potete fare il bagno nel lago. Al campeggio Camping du Lac de Saint-Cyr è possibile praticare windsurf e canyoning/canoa/rafting. Ogni anno un ispettore visita il Camping du Lac de Saint-Cyr, controllando oltre 200 tra attrezzature e altri punti di interesse del campeggio. L'ispettore è un dipendente ACSI e non lavora per il campeggio. Very helpful reception, clean toilets and a reasonable camp restaurant. The address on the ACSI app is wrong! Check with the site to get the right one. Beautiful lakeside setting, swimming pool being enjoyed. Great for families or touring couples. at the far end of the site is not good. It\'s a long walk. There should be a facility for this near the toilet blocks. The site is spacious and well organised. It's more of a holiday park than a camp site. The lake is great - we cycled round it very quickly. The nature reserve is worth a visit, with good gravel tracks, several hides and lots of noisy French kids. The site has unisex toilets and wash areas, but no wash cabins, which is a bit off putting. It has a private cubicle for cassette disposal - a bit unnecessary. We left site at 12.30, but because of a language mix-up, reception was closed. They said they'd open at 12, whereas they meant that they'd close at 12. Had lunch in nearby park and went back for ACSI Card at 2. Missed out on Trip into Poitiers. The staff are very nice and helpful. The food in the snack bar is lovely when you can get it. We were also close to other places to visit. The wash rooms were kept clean. The restaurant is not in easy walking distance from the site. The snack bar was not always open when we wanted to eat or have a drink before heading to bed. The "sandy" beach on the lake is of the type of course sand used for building. Because of this I never went on it. Our pitch was 81 and we got flooded out in our tents. The staff had to lay 1 ton of sand to soak up all the water. The showers were not hot everyday, meaning we had to have cold showers before leaving. The reception only opens at 9am so no good if you are leaving early as they hold 1 passport and this needs to be collected when leaving. A supreb site. We used it only for a night halt but were enticed to walk part way around the lake before we cooked our meal and then to walk round the other way the next morning before leaving. The surroundings are very attractive, pitches of an adequate size and the toilet facilities are well kept and clean. Wifi only works near the office but that is not an issue. In late May the site was quite empty. There are bird hides positioned around the lake, ideal for spotting the indigenous birds. Frogs are quite noisy but cannot be heard from the site. The surroundings of this site are really beautiful and the lake and beach were a lovely feature and provided many hours of fun with swimming, pedaloes and kajaks etc. The pool was great too and the bike hire was reasonable and enjoyable as you could cycle round the lake quite safely without endangering the locals! Credit to the owners a beautiful site & surroundings, great sized pitches, lovely outdoor pool. Toilets & showers ok although are very clean. We went June so all amenities not open which wasn't a problem. Food in snack bar could be better - the bar itself nice to sit looking over the lake. Lovely cycle/walk routes. Not really any shops nearby unless you have a car. Make sure to stock up before you go if travelling in motorhome. Definitely recommend & wouldn't hesitate to go back. A very pleasant site but the critism we have is with the ACSI directions. I can find La Tricherie on the map but was unable to find it signed when driving. Suggest you should say on reaching Beaumont, this will give you an opportunity to look for the site directions in the right area. This is a beautiful place the campsite was excellent. We were there at the beginning of July and our Grandson went on organised cycle rides, kayaking and other things. It is very near to Futuroscope too. We will definitely go back. Excellent campsite on the side of a lake. Beach, water sports all available. Bird sanctuary on the other side of the lake. Good golf course (lovely scenery) within 1 km but a bit expensive (91 Euros for two). Plenty for children to do. Futurescope within 10 minute drive. Hawks, crocodile and snake parks all within reasonable driving distance. Nice walk or cycle path around the lake. Shop and snack bar open, serving the campsite and lake visitors. Circus training tents by the lake entrance (high season). Good reception with free wifi, fitness centre and TV room. Showers and toilets very good (showers on one side warmer than the other side!). Pitches very good but a few electricity hook-ups were a bit suspect. Needed a French two pin plug as well. Would have stayed longer if we had not had a ferry to catch. Shops okay with a car but motorhomes may need to stock up before arriving. Volete prenotare il Camping du Lac de Saint-Cyr o oppure saperne di più? Potete farlo usando i seguenti dati. A Beaumont-La Trichérie a sinistra (dopo 15 km) e seguire i cartelli. Venendo da Poitiers, prendere N10 per Châtelleraut. A destra a Baumont-La Trichérie poi seguire i cartelli. 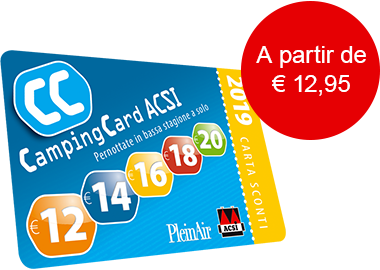 ACSI Eurocampings invia la tua richiesta di informazioni al "Camping du Lac de Saint-Cyr".